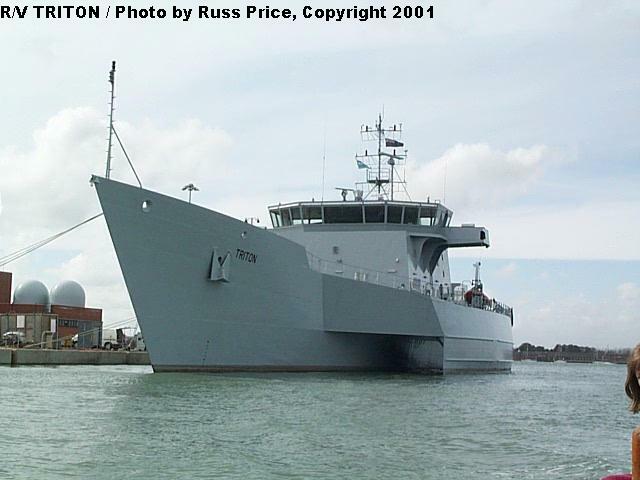 R/V Triton is a 318-foot (97-meter), 1,100 ton trials vessel built by the UK Ministry of Defense to test the trimaran hull concept for use in future warships. In addition, she is testing other new technologies, such as electronics and controls. 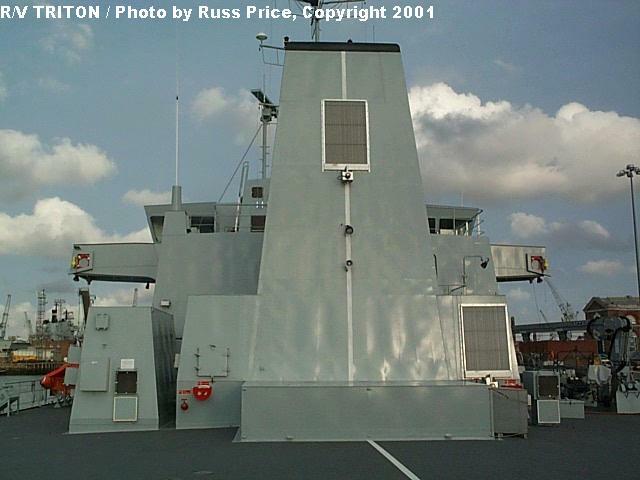 The most likely application for the trimaran hullform is the Royal Navy's Future Surface Combatant program, a frigate-type ship intended to replace the existing Type 22 and Type 23 frigates, starting around 2012-2015. 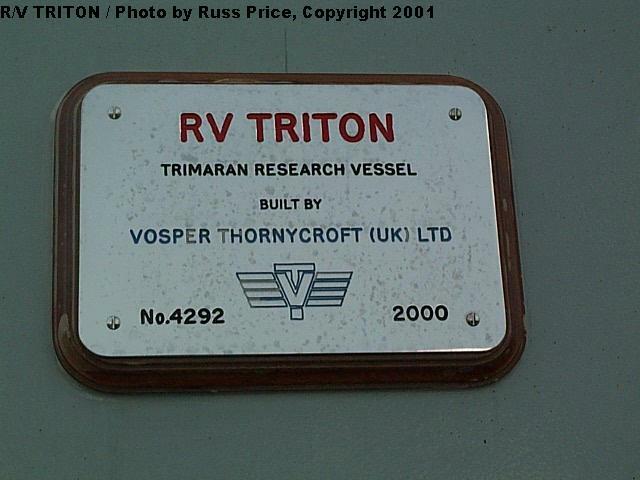 The majority of photos in this feature were taken by Russ Price while Triton was in the UK at the start of her trials program. In the course of the trials program, which is being conducted in cooperation with the US Navy, Triton also visited Washington, DC. 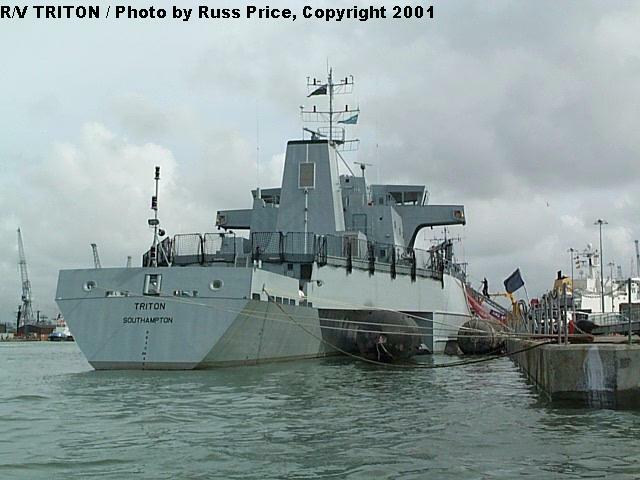 A general port-side view of Triton, showing the separation between the main and side hulls. 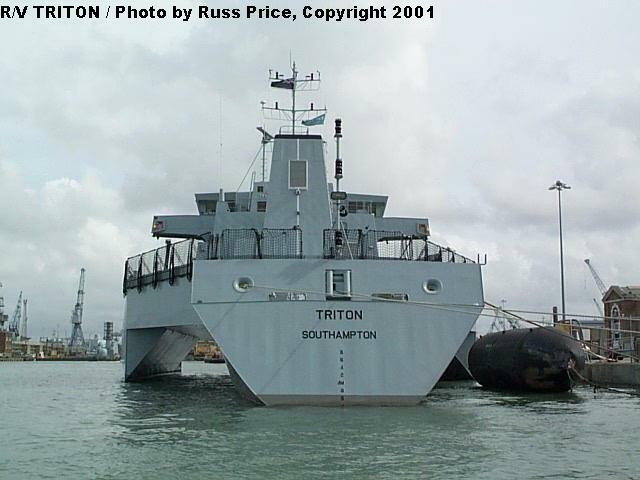 Although she is testing warship concepts, Triton is unarmed and built to commercial standards. 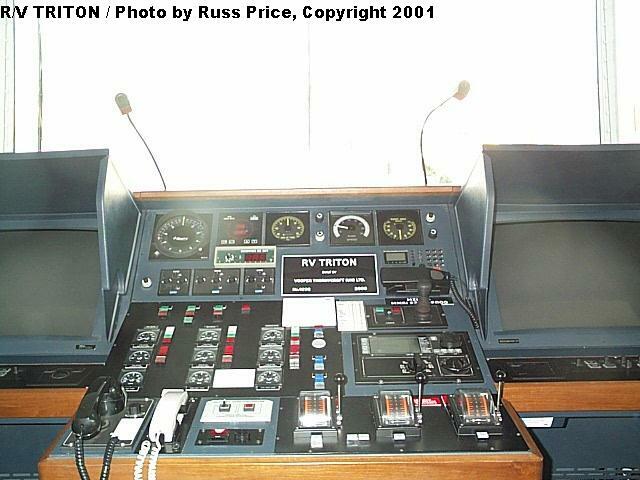 A starboard-side view from astern. 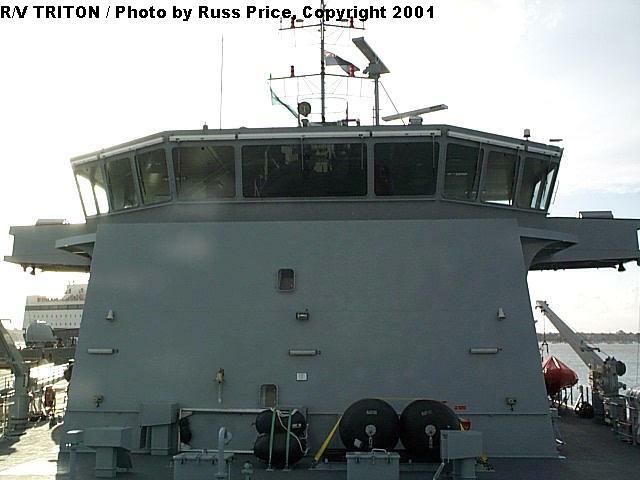 Triton has a small helicopter deck abaft her superstructure, suitable for light helos, but no hangar or support facilities. A stern-on view, looking between the main and side hulls. 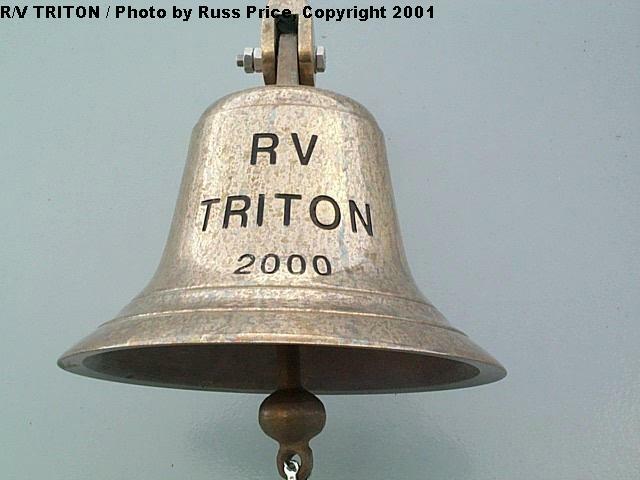 Triton's bell and builder's plate. 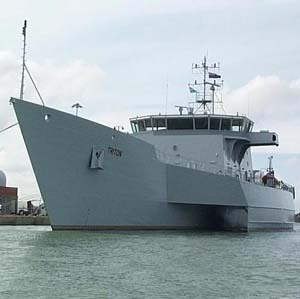 She was constructed by Vosper Thornycroft, with the first steel cut in January 1999, and completion in late 2000. A view of the bridge from the bow. 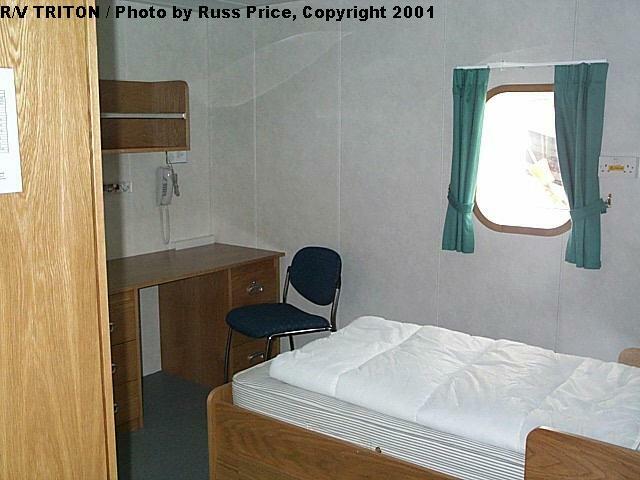 A typical single-berth stateroom aboard Triton. 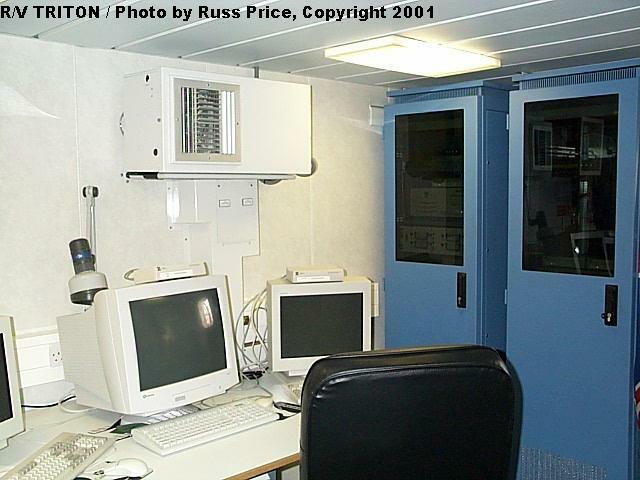 The Trials Instrumentation System used to record performance data during the trials program is a joint US/UK project. 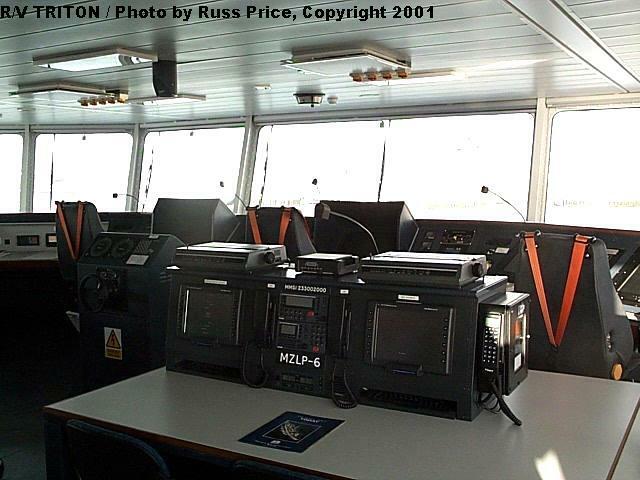 Another view of the Trials Instrumentation system and monitors. 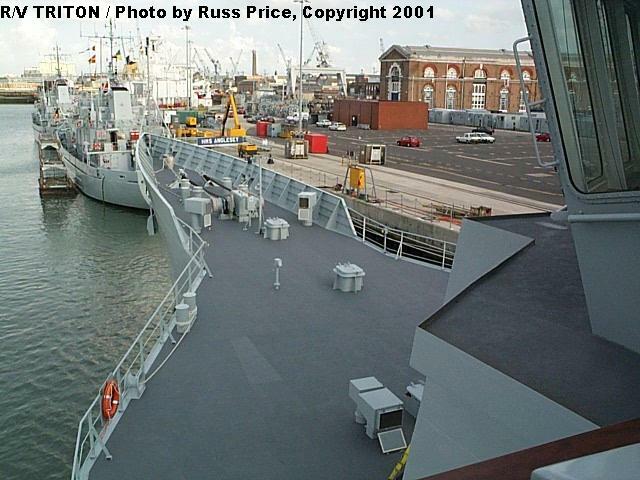 View from the port bridge wing towards the bow. 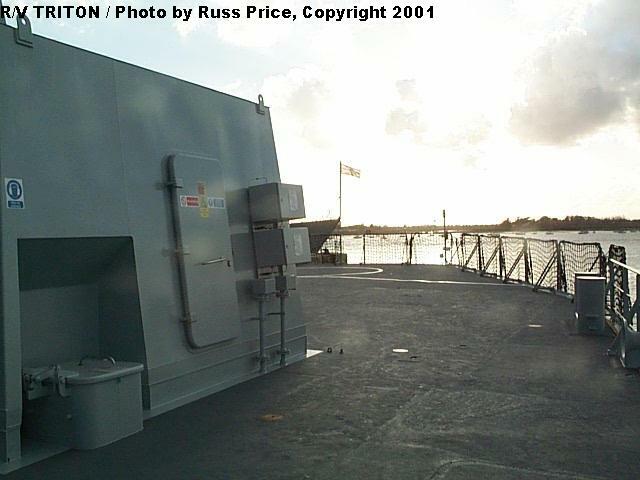 This view clearly demonstrates the large deck area made possible by the trimaran design. Looking forward from the bridge. 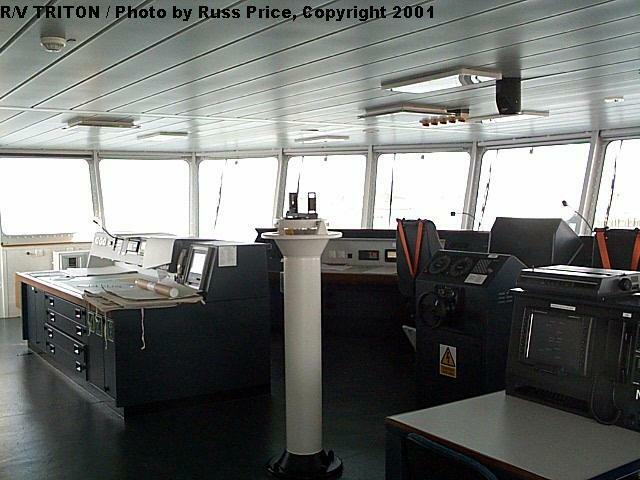 View from the port side of the bridge, looking to starboard. Another view of the bridge, from the starboard side looking forward. 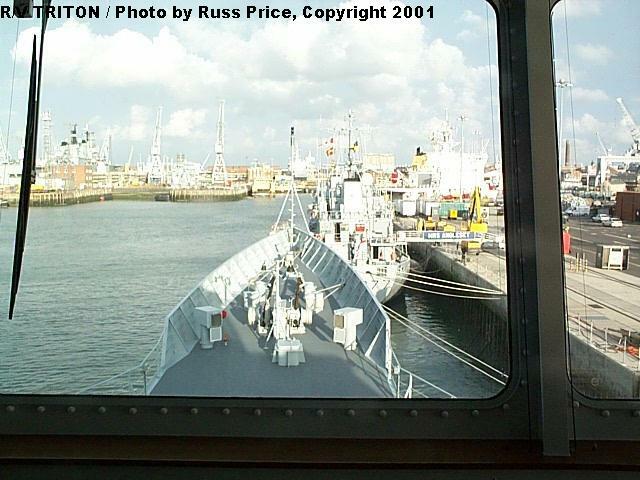 A third bridge view, looking to port from the starboard side. 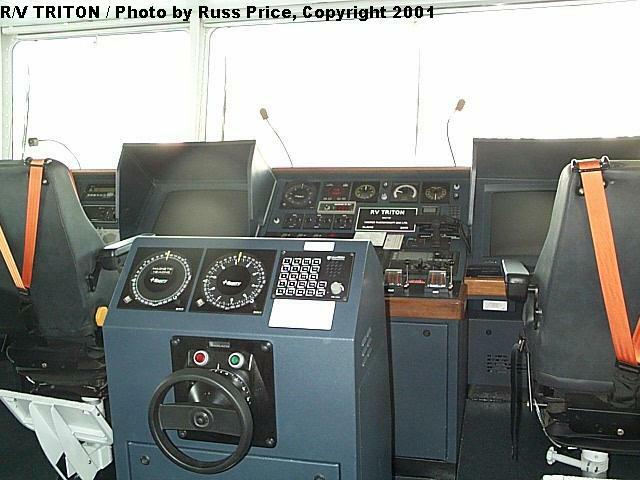 One of the main control consoles on Triton's bridge. 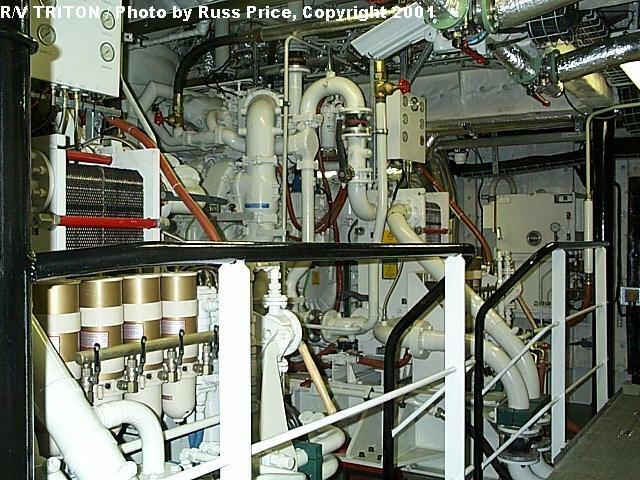 One of Triton's diesel engines. Her main propulsion is diesel-electric, with two diesel generators driving two electric motors, which in turn drive a single propeller. There are also two low-speed electric motors in the side hulls. 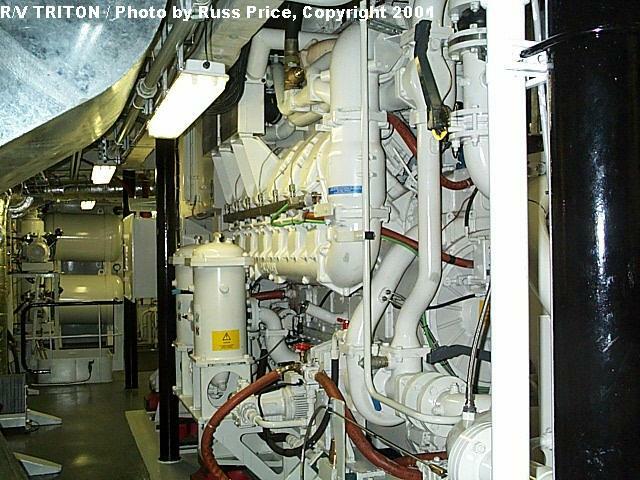 Another view of one of the diesel engines. 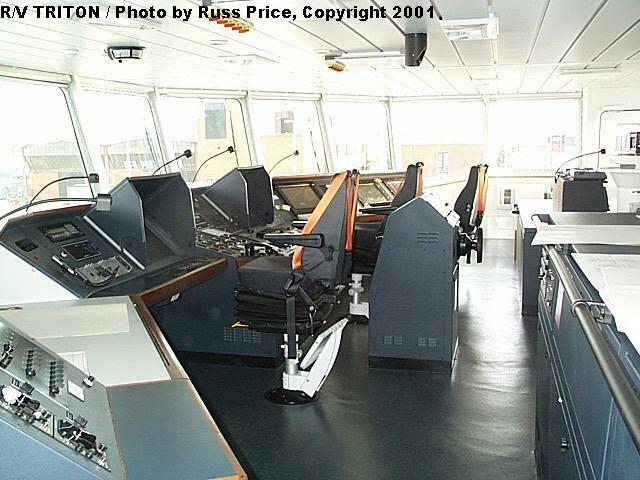 A view from the flight deck, looking forward at the superstructure. 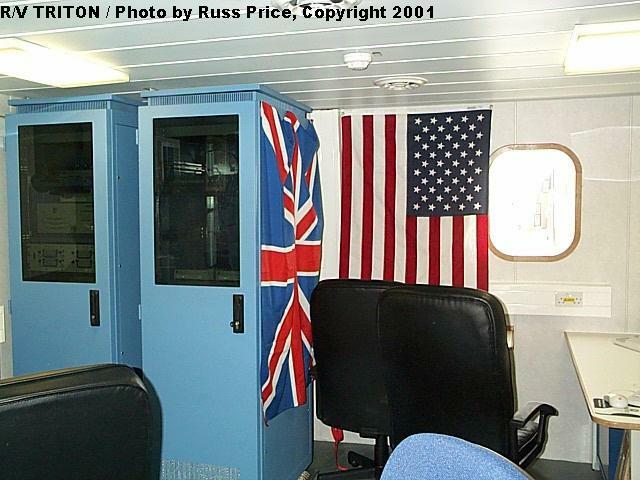 Looking aft along the port side, across the flight deck. 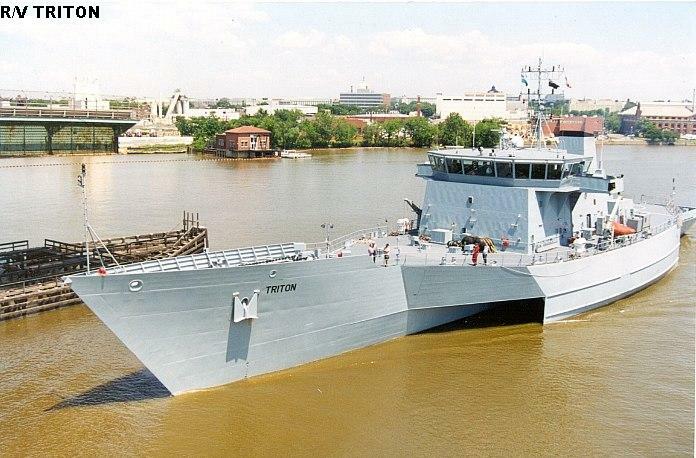 Triton arriving in Washington, DC. 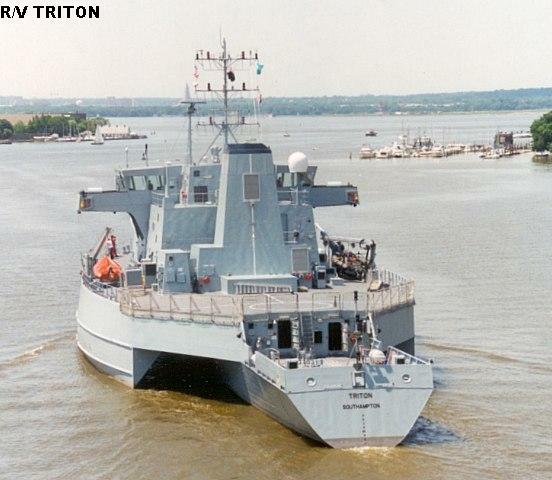 A stern-on view of Triton as she arrives in Washington. Photos copyright © 2003, Russ Price. All Rights Reserved. Used by permission.